We are a small charity offering help and support to those affected by Kleine-Levin Syndrome (also known as Kleine Levin Syndrome or KLS). Since we are a UK small charity (and concentrate on UK information) we ask that those in other countries please contact the KLS Foundation. It is easy to contact us by filling in the Contact Us form. One of us will reply as soon as possible. We are happy to speak over the phone (after email contact). We appreciate that you have been through a traumatic time and may find it therapeutic speaking to someone who has experience of KLS. We are happy to put people in touch with each other if/when they are ready (by mutual consent). We try to pair those who have similar KLS experiences. We help with those seeking diagnosis and those diagnosed. For KLS Support UK news and updates please click here and then fill in the contact form to be subscribed to our mailing list. 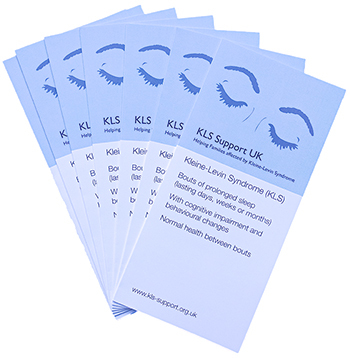 The KLS Support UK Information leaflet can be downloaded and printed to give to GP's, family and friends, the text etc. has been approved for NHS use. We are delighted to be listed in the Patient.co.uk directory - where our leaflet is mentioned. This will make it more readily available to doctors and patients alike. If you would like to just view the leaflet please right click here and open in a new window or tab. If you would like a printed copy/copies please contact us and we will post some to you. 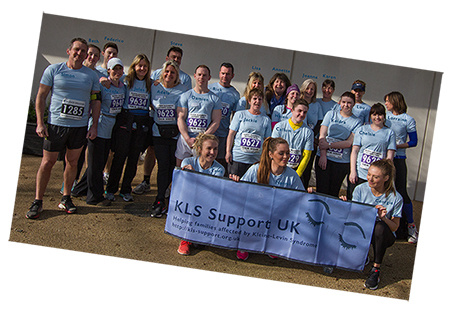 KLS Support UK is the only UK small charity representing families affected by Kleine-Levin Syndrome. Trustees:- Adele Clarke, Lachlan Dunbar, Danielle Harris, Professor Beverley Hunt, Caron Krieger.